Submissions are free of charge during 2019. 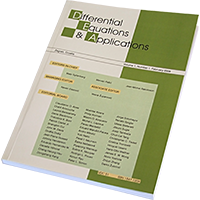 'Differential Equations & Applications' ('DEA') aims to publish original papers from the fields pertaining to ordinary, functional-differential, and partial differential equations. Only papers of the highest quality will be accepted for publication. The papers which demonstrate novelty, establish relations of differential equations with other fields of mathematics or examine a variety of applications of differential equations are particularly welcome. Abbreviations: DEA, Differ. Equ. Appl.